Assistant Professor of Biology Satoshi Yoshida kicked off the Life Sciences Summer Research Seminar series today, describing his research on wound healing in yeast to a capacity crowd in Rosenstiel 118. Wound healing in cells has been a difficult problem to study, partly because methods to create defined wounds in cells in a genetic model system have been lacking Yoshida and co-workers discovered that after focusing laser light at sublethal dosages on a budding yeast cell, the yeast cell responses by reorganizing its actin cytoskeleton so that the focus of growth goes away from the bud and towards the wound site. Yoshida described experiments to then define the genetic requirements for this shift in focus, with key players including Rho GTPase, protein kinase C, and the formin Bni1. Yoshida discussed results from his recent Cell paper “Competition between Cell Polarization and Cellular Wound Healing” as well as more recent ongoing results from the lab. There was a lively discussion following the seminar with eager students suggesting all kinds of possible follow-up experiments. The seminar series will continue next Monday, July 16 at noon in Rosenstiel 118, with presentations from Jerome Menet (Rosbash lab) and Adam Osborne (Wangh lab). In a recent paper in Journal of Cell Biology entitled “Spatial regulation of Cdc55-PP2A by Zds1/Zds2 controls mitotic entry and mitotic exit in budding yeast“, Brandeis postdoctoral fellow Valentina Rossio and Assistant Professor of Biology Satoshi Yoshida reveal a molecular function of a mysterious protein Zds1. 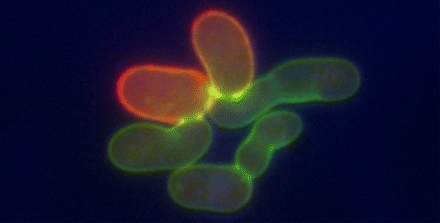 The Zds1 protein in yeast was identified some years ago in “a zillion different screens” for cell cycle mutants, stress response mutants, RNA metabolism mutants, etc., but the molecular function of the protein remained a mystery for more than 15 years. Rossio revealed that Zds1’s key target is a protein phosphatase 2A (PP2A) complex. She showed that Zds1 controls nucleocytoplasmic distribution of PP2A complex, and that this regulation is critical for cells to know when to enter and to exit from mitosis (picture below; cells lacking Zds proteins adopt an abnormal shape because of problems in mitosis). Rossio thinks all the other complicated phenotypes associated with ZDS1 can also be explained by PP2A regulation and is currently studying mechanistic details about the Zds1-PP2A interaction.